Anyway, where was I. We had an absolutely fabulous holiday! The best ever. And I have to say, everyone told me this would be the case before I left, and it is...New York is my new favourite place in the world! Loved every single minute of it and didn't want to leave, even with all the other places we still had left to visit. I can't believe the last time I sat down to write a proper blog post was back on the 12th June, so much has happened since then! My most favourite city, New York! I haven't posted a Pic A Day for 8 days either so I will get on to that asap! I also need to update the Pic A Day blog so I apologise if you are suddenly bombarded with a zillion posts from me in your dashboards/readers. Surprisingly I didn't read much at all while we were away, considering all the plane trips. Actually I lie. I did read a fair bit but it was all magazines! I think I have read every weekly gossip magazine in the US! Yes I know how that sounds, so I balanced it out with some James Patterson (Book Fair freebie!) and Newsweek and Time magazines. And I can solemnly swear they are all as crap as the ones we have at home. If not more so! The gossip mags that is, Time and Newsweek were interesting for their takes on stuff. But of course the first thing I did when we got home was buy Who Weekly. Old habits die hard. Plus technically it was my birthday so I was allowed ok! 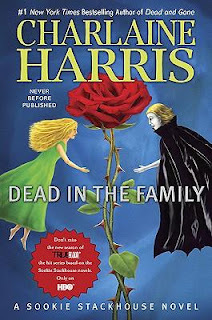 I did read one book while I was away, the 10th and latest in the Sookie Stackhouse series (the books True Blood are based on). I really enjoyed it. But more on that later. So while I was away I had some very lovely ladies guest blog on their Fav Books and I would love it if you had a look. I have a couple more up my sleeves which I can now sort out thanks to reliable Internet service and being able to check my emails properly! Did I mention that I am loving having my Blackberry back?! While our trip was fantastic it really is good to be home. I am not gonna miss packing suitcases for a while that's for sure! If I don't pack another suitcase for at least 6 months I'll be happy! But kinda sad at the same time if you know what I mean. When we flew into Sydney last Monday night Dave was kind enough to let me have the window seat for our descent. The only other time I have flown into Sydney (when I was 15) at night I was stuck in the middle set of seats and all I could see was the back of people's heads looking out of their window seats. As my Dad said when I was 15, its a truly cool sight! Made sweeter by the fact it's home. It was also my birthday, which was totally bittersweet. Ending a fab holiday with my birthday is cool, even if I only 'officially' got 5 hours of it! (I stuck to Hawaii time and celebrated my birthday till 8pm on the Tuesday! hehe!). A few things have changed while I was away, when I left the country I was 27, I worked in a heritage building, my direct dial number was 403 and Kevin Rudd was the Prime Minister. After a week back in the country, I'm 28, I work in a warehouse in an industrial area, my direct dial is 614 and Julia Gillard is PM. Not happy Jan! or Julia! But more on this circus of a government later! In good news I'm only peeling a little bit from my Hawaiian sunburn (and my SIL said we looked yellow...apparently you get a different colour tan in the Northern Hemisphere...is this true? I thought I looked the same colour as always! ), and it's lovely to hear Australian accents again and see my Panthers sitting sweetly at number 2 on the NRL ladder! But not happy Blues! It's bloody freezing tonight (they are forecasting -2 tonight! Brrrr! ), a rude shock after almost 5 extra weeks of summer! I hope you are all rugged up and all is well for you if you're chilling down here in the Southern Hemisphere. And if you're in the Northern Hemisphere? Well, I wish I was there too! P.S Finally finished this post at 10:17pm! Loving Magda on Q&A tonight! I am glad to hear that you had such a nice holiday!